In the new Aliens vs. Predator game, Lance Henriksen is confirmed to reprise his role from the AvP movie as a descendant named Karl Bishop Weyland. Screw Sigourney Weaver, Lance Henriksen is the real face of the Aliens franchise. Henriksen played the android Bishop [He prefers the term "artificial person," himself. -Ed.] in Aliens and Alien 3, as well as the founder of the Weyland-Yutani Corporation, Charles Bishop Weyland, in the Aliens vs. Predator movie. Sega announced today that Henriksen will appear in the upcoming AvP being developed by Rebellion Games the UK, lending both his likeness and vocal talents to the performance. 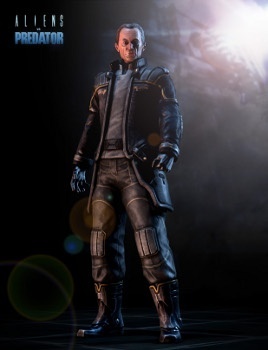 He will play a scion of the Weyland family, Karl Bishop Weyland, but no other details are available on what his agenda will be in the game. AvP is slated for a February 2010 release on the PS3, 360 and PC platforms. "They've made me look very good," said Henriksen. "This is the first time I've been fully represented in a game, with my voice and how I look, and the Rebellion guys have done a great job. I might score from this game!" Dude, you don't need this game to score. You're freaking Bishop. I mean if you clean up all the milky crap coming out of your android mouth, and maybe lose 20 years off your haggard visage, I'm sure there are, I don't know, maybe 1 or 2 ladies out there who'd like to go out with you. Maybe?